American alt-right and Twitter bots are key to spreading French election hack. 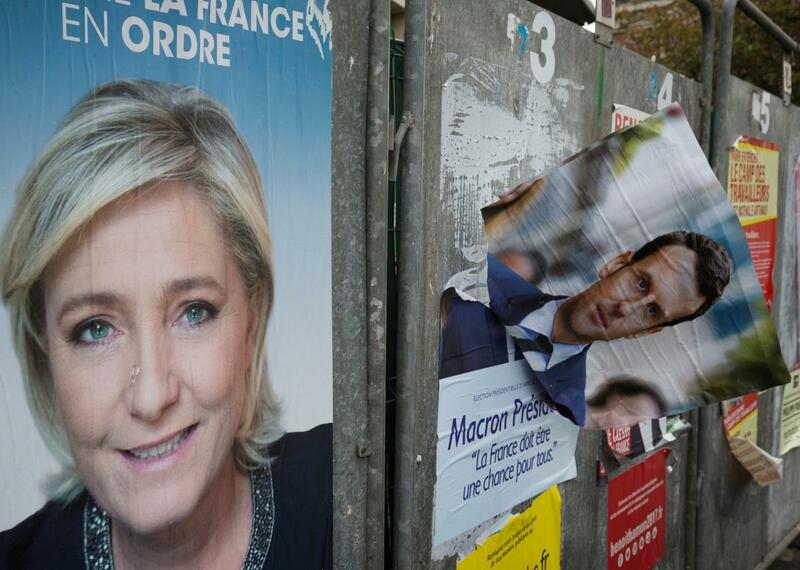 A picture taken on April 24, 2017 in Henin-Beaumont, northern France, shows campaign posters of French presidential election candidate for the far-right Front National (FN) party Marine Le Pen and candidate for the En Marche ! movement, Emmanuel Macron. France’s election rules force candidates to stop campaigning on Friday at midnight and the country enters a period that is supposed to be for quiet reflection before Sunday’s vote. The only problem is that quiet and reflection are two things that don’t quite mix very well with the social media era. On Saturday, news of the hacking attack against centrist Emmanuel Macron spread like wildfire on social media, pushed along in large part by U.S. far-right activists and bots. An extraordinary number of tweets about Macron’s campaign in the day before the vote appear to be coming from automated accounts. One study found that “five percent of users accounted for a full 40 percent of the tweets” related to the French election. One account tweeted a whopping 1,668 times in 24 hours, faster than one per minute. And it was hardly alone. “For several of these accounts, the tweets were coming through in bursts too fast for an individual to keep up with them, suggesting automation rather than a highly active human,” researchers wrote. 5% of #MacronGate users account for 40% of tweets. The most prolific tweeted 1668X/24 hrs―faster than one RT per min, all day with no sleep. Twitter appears to be ignoring the problem entirely. When Recode asked Twitter what it was planning to do to combat the bots, the company spokesperson merely said that bots are prohibited. Bots aren’t the only ones spreading the news of the hack attack. Members of the extreme American right are also taking the hack as an opportunity to take a last stand in favor of Marine Le Pen. Approximately half of the Twitter posts about the hack have been written in English and many of them are coming from the United States. Although there is no evidence that far-rigth activists in the U.S. were behind the hack, they have been spreading the leaked documents in some of their favorite gathering spots, including 4chan. Jack Posobiec, a journalist with an obscure far-right website, appears to have been the first to use the #MacronLeaks hashtag, according to the Atlantic Council. Then bots appear to have been used to amplify that message. Less than two hours later, Le Pen’s “most active and aggressive” supporters online were spreading news of the leak inside France. Taken together, the data indicates that the #MacronLeaks hashtag was initially launched in the US and was driven by a cluster of alt-right accounts and probable bots. It was then picked up by Le Pen supporters, and probable bots, and passed on to the French audience. WikiLeaks played a key role in publicizing the hashtag; the leading US amplifiers of #MacronLeaks were mentioned more than their French counterparts; but overall, French posts appear to have predominated. While the authenticity of the “leaked” documents is still in question, the alt-right’s activity in amplifying the #MacronLeaks hashtag is not, pointing to yet another attempt to skew democratic elections in a Western country.